Overall I would have to say the show was ok. Of course even without words Home or Lawn in the title there seemed to be the occasional booth that had nothing to do with gardening or flowers - squeegees & jewelry. 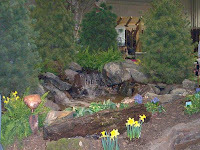 Usually I stay away from Home and Garden shows since they rarely have much garden related. This years QCCA Flower & Garden Show did seem to have a few more garden related vendors. Even with the garden/flower theme though, the majority of the show seemed to be waterfalls and concrete….lots, & lots of concrete block everywhere. What the show seemed to be lacking were the blossoms. The flowers seem few & far between. I remember a few years ago when the displays were packed with blooms, but this year the sparse look must be in. I thought the Rock Island Horticulture Society had the most interesting packed display showcasing all sorts of bonsai, conifers and a fat little Buddha. edit: Sorry about that. Didn’t mean to Where Waldo anyone. The Buddha isn’t actually in this photo. Ok, so the real reason I go to the show every year is that I am a huge rock junkie. 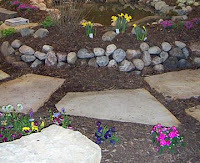 I love garden rocks and I know most of my friends think it’s extremely silly to actually pay for a rock, but I always go to the QCCA Flower & Garden Show because Mar-Qui has a display of awesome rocks. For the last few years I’ve picked up at least one rock from them and now I’m tickled to report they let people host “Rock Parties” now. Now I can get back at all the people that have sent me candle party invites the past few years. To sum things up, the Quad Cities QCCA Flower & Garden Show was probably better than I expected vendor wise. The displays lacked blooms but most of them were still interesting. It was nice to see all the area clubs and feel like a purchase was going to help something locally. Will I go again next year? Of course! I’ll need to purchase another rock or two.